Vega seems to have the supplement world firmly in it’s grasp these days. There is really something to be said for ‘first-to-market’ I guess. If you’re unfamiliar with the brand, then you have been living under a rock or in a cave for the past twenty years. Just kidding. Fifteen years. Seriously though! I feel like Vega is the OG ‘natural’ supplement company. Sure a few have come and tried to follow in it’s footsteps (Optimum, Quest, and Progenex to name a few). But none have really seemed to capture the same feel of the brand. And the feel that I’m talking about is that sort of ‘Whole Foods-ie’ situation where you know the product is going to be expensive but at the same time of the highest quality. For me personally, I went into this review expecting one aspect of the product to be severely lacking. Any guesses what it is? Well, if you read my Vega Sport Pre Workout Energizer review a few years ago you might have good idea what I’m talking about. Because that pre workout tasted straight UP FOUL. It was really awful. I mean. I’ve tasted some downright nasty supplements in my day, but this one is on the all time list. The you-know-what list when it comes to taste. But hey. I’m an optimist. No matter how skeptical I might have been I pulled my head around and made sure I was thinking on the glass-half-full side of things. I wanted Vega One to be the best darn tasting protein this side of Gardenia. Hey, that sounds sort of poetic. As you know (or don’t), Gardenia is what I consider to be the best-tasting vegan protein in the whole wide world. So. Did Vega One protein match it? As surprising as it may seem, an even 8 is actually a massive accomplishment for Vega One in my eyes. Creating a decent-tasting plant-based protein is a feat in itself. But making this stuff taste halfway decent WITHOUT using artificial sweetener is something else entirely. It’s borderline impossible. And I have no idea how these guys have managed to do it. It makes Gardenia even MORE impressive actually. But let’s talk about what Vega One actually tastes like. The flavor that I tried was the French Vanilla, and it quite frankly it tasted like. Hm. Not French vanilla. In fact I’m not sure I tasted much vanilla in here at all. I guess maybe the overall smoothness of it REMINDED me of vanilla but it was certainly nothing like the sort of super sweet smooth milkshake flavor that you get in something like an APOLLO or a NDS Amplify Smoothie. No. This flavor was very very different. Similar to the other plant-based protein supplements that I’ve tried, I wasn’t a fan of the texture- which is the first thing you will notice when the liquid first hits your lips. I mixed my Vega One shake with about 12 ounces of skim milk, and the flavor still was not very good. In water you can be certain it’ll be much, much worse. The taste is sort of grainy, but it is also moderately sweet. I would say the sweetness of Vega One All-In-One is below the sweetness level you get from some more traditional whey proteins, but I think that making this one overly sweet would have been a mistake, because there are really alot of different, strange flavors in here that would not play well with super sweet. Maybe something to do with the fact that each dose contains the equivalent of 3 cups of broccoli, kale, spirulina, and chlorella. Yes. Those are hard to pronounce. And yes they are incredibly good for you. But now we’re getting more into the formula. Great segue, Allie. 1.5 grams of Omega-3’s. Not a TON but still a nice add-in to Vega One. 6 grams of Fiber. Again. Not bad. Biotin, Folate, Vitamins A through Z (basically). 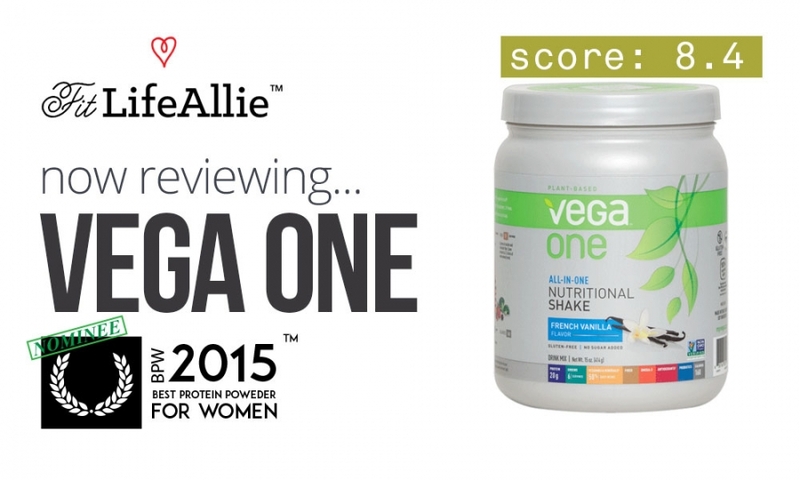 Nobody really is surprised that Vega One is one of the healthiest protein supplements under that sun. Quite frankly I wouldn’t expect anything less from Vega. In terms of add-ins and bonus points, we’re really on the same level as some of the ultra-premium meal replacements. We’re talking Shakeology. We’re talking Cleanshake. I mean. This is rare air, folks. It really is. But the thing is, you aren’t going to give up an arm and a leg to get this unbelievable formula. Just the arm has to go! Lol. But seriously. As we’ll get to a little more in the Vega One Review Summary, this stuff ain’t cheap. But just look at the formula. It’s no wonder it tastes awful. It’s like all the best stuff under the sun crammed into a huge food processor and then powder-ized. The only thing I wish was different is probably using some quinoa in place of the pea protein. I don’t HATE pea protein, but it certainly is not my first choice. But I do like Saviseed (Sacha Inchi) protein, which is quite expensive and suits Vega One well. Now that we’ve had a chance to discuss the formula, let us have a look a the label and give Vega One Protein the classic Fit Life Allie packaging grade. I kind of wanted to give this packaging a lower grade because it doesn’t really speak to me at first. But as I give it an even deeper look I will say that I’ve started to gain a better appreciation for all the little design elements on the Vega One package that don’t jump out at you at first. Looking at the big picture, the whole appearance seems just a little ‘washed-out’. First of all, the color fo the tub, and the backdrop of the label are a very, very subtle and generic pearly silver. I don’t agree with the choice to use such an unnatural looking color on a product that is supposed to echo ‘natural’ almost to the point where you feel like you dug the stuff straight out of the ground. (That’s what it tastes like, LOL). But seriously. The silver is sort of bland, and then the feature elements of the label, which are the name ‘VEGA ONE’ and also the big leaf graphic, are just far too bland and boring in my opinion. They don’t pop in the least. And unless you are right up close to the product you can’t barely read it! That’s a design flaw in my opinion. Vega One did do some things right, though. Perhaps the most thoughtful element of the design is the colorful bottom strip that houses some of the critical information of the product. Telling you servings, amount of protein, amounts of greens, etc. etc. It catches the eye while giving the customer confidence that they bought one of the healthiest products in the entire world. Anther thing that I like, and that Whole Foods also likes, is the Non-GMO seal that is proudly slapped onto the front panel. There’s something about that seal that gives a tremendous amount of prestige to the product that bears it. I think it’s both a design element and an overall product asset. Lastly, the vanilla flavor graphic is adequate. I won’t say that I love it, just because it’s not nearly as prominent and beautiful as some flavor graphics (see EHP Labs Oxywhey for example), but it’s just ok. Ok. I think we have enough information to wrap this thing up. Well. Vega One is just about what I expected it to be. This is a plant-based protein that has just about the healthiest formula that you can find. It is below-average tasting, and very average looking from a packaging standpoint. Priced at $3 / serving, you pay a premium for the no-expense-spared formulation. If you value the nutritional aspect above all else, and don’t mind a sort of jarring taste, than this one is for you. If you’d rather have something with better taste, but just slightly less nutritional value, go with Gardenia.